I often write about making sure you keep in touch with your patients and how you can do this. One great way to keep in touch with your patients is through social media. So many of your patients are now on social media, checking posts every hour or so and staying connected and engaging with their friends. Patients of all ages are using social media to stay connected. You should be using social media to also stay connected with your patients and be there ready to engage with new patients who find you. Be friends with your patients on social media. Social media is all about social proof. What people read and see on social media is powerful and a can be a great referral source for your dental practice. So many dental offices create a facebook page then post nothing. Think of social media as an extension of your dental office. One facebook page I looked at the other day had no posts since 2015 and of course there was no patient interaction. Keep in mind that your patients may not see you for 6 months. Facebook is an excellent way to make sure they still remember who you are and gives you and your patients an opportunity to interact and stay connected. Keeping in touch with your patients is about being memorable, being someone that is part of their lives and then they become part of yours. So the next question I often get asked by Dentists and their teams is, what do I post on my practice facebook page or instagram? Anything that your patient will find interesting and fun. 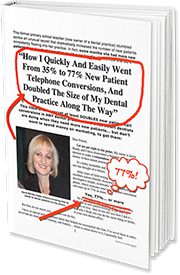 Now I would love to tell you that your patients get excited about the latest piece of dental equipment in your office or the latest implant technology but they don’t. I am not saying don’t add posts about your dental practice equipment but only now and then and make it all about the patient. Add a picture of your patient sitting in the new dental chair and make it fun! Fun is what your patients like on facebook with a little dental information. Your posts should be quick and have a minimal amount of reading. The picture is worth a 1000 words of course so add a great picture. Your patients want to see you and your team and other patients. Th emphasis should be about people and how they enjoy coming to your dental practice. Your cover photo should be you with your fun and professional team. People love seeing photos of people and will be immediately attracted to your page. People are also very attracted to videos so make sure you add some. Short videos are the best with you and your team at the practice. When your patients come in for their appointment make sure they like your facebook page or instagram while they are there. Your patients will now start getting notifications of posts you add to your facebook page. Add a post each day and reply to your patient’s comments as soon as you can. Your patients will love the acknowledgment and will often continue as time goes on to write comments on your posts. If you want to take your social media presence to the next level then definitely hire someone in the know to help you with advertising and marketing your dental practice. Now you will be keeping in touch with your patients, interacting with them and staying connected with them, until you see them again in 6 months!